KEY FEATURES: Annual erect herb to 1.2m. ROOT short taproot. STEM hollow, milky latex. LEAVES alternate, stalkless, glossy; to 25cm; arrow-like, w/wo dissection leaflets, basal lobes round and clasp stem; edge with sharp teeth. 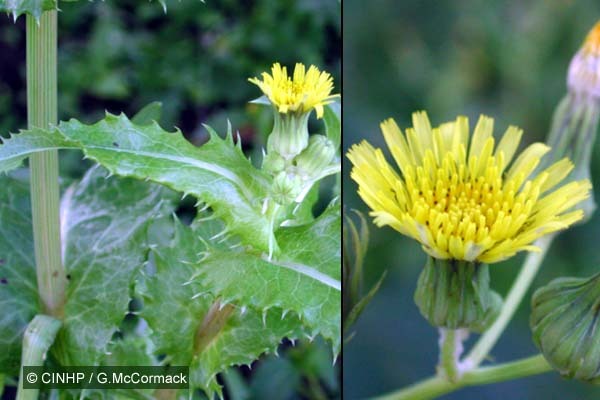 FLOWERS erect, yellow, to 2.5cmØ; 50-250 small ray florets with 5-toothed ray; ripening into white pompom. FRUIT an achene to 3x1mm; with white hairy tuft (=pappus). NEGATIVE SIGNIFICANCE: Weed - minor. Comments: A minor weeds in gardens. GENERAL NOTE: In Europe used as stock fodder and also cooked and eaten as greens by people. In Fiji it was introduced early in 1800s being widespread by 1855 [ACSmith, Flora]. Hawaii naturalised before 1871 [Wagner et.al. flora]. For Rarotonga, Cheeseman had it as 'not uncommon' in 1899.